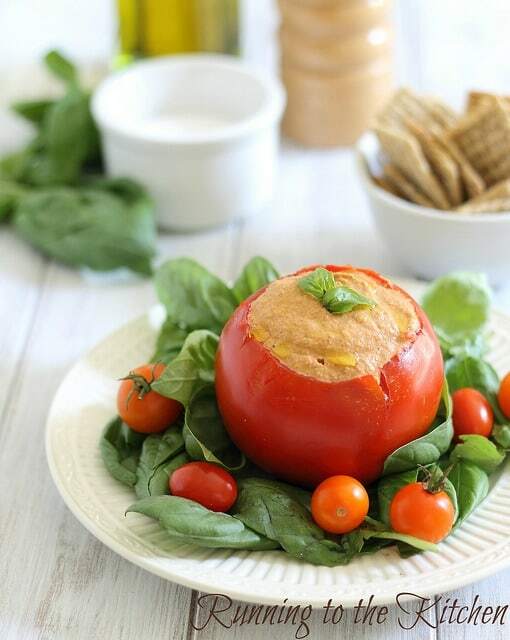 This paleo friendly roasted tomato cashew hummus is creamy and decadent without the beans. More tomatoes. More roasting. It’s getting a little broken record-ish over here, huh? Sorry. Except not really. 1. Dairy and I might not be as bff as I thought (this is only slightly problematic as I have a shelf full of greek yogurt in my fridge right now) considering I think I’ve lost a pant size from lack of bloating alone. 2. I miss hummus. Like, a lot. I don’t really understand the whole “say no to legumes” thing that paleo advocates much beyond the fact that they have phytates and apparently that’s bad for you. I’m playing by the rules for a month just to see what happens, what changes I see and how I feel, but I struggle to understand this one. Did cavemen know what the hell a phytate was? I doubt it. Beans were around then, who says they didn’t eat them? I need more convincing on this. Hummus was my go to afternoon snack. It’s a lovely way to get in veggies without having to boringly munch on raw ones and I needed a replacement stat. When you soak ‘em (soak your nuts, ha) they turn soft (double ha) and almost resemble a bean texture wise, so it actually results in a pretty similar consistency to hummus once you whirl everything around in the food processor for a few minutes. Roasted garlic, roasted tomatoes, and basil just seal the deal. Oh, and add 1 triscuit to that cheat list up above. Oops. Toss tomatoes with 1 tablespoon olive oil, honey and salt & pepper in a large bowl. Spread out onto baking sheet. Cut off tips of garlic cloves, drizzle in olive oil and wrap in aluminum foil. Place on baking sheet with tomatoes. Roast for 25 minutes. Remove from oven and set aside to cool for 10 minutes. Place cashews in food processor and process for about 1-2 minutes until smooth. Add in all remaining ingredients and process for another minute until fully incorporated, scraping down the sides as needed. I love grains too much! Love this idea for a “hummus” replacement though! I hear a lot about soaking nuts, I haven’t tried that!!! Maybe this weekend. OJ, I was going to say something gross but I won’t! Anyway, your hummus looks amazing and i love that it is made with cashews over chickapeas. I am quite intrigues by this recipe and I can see myself making it for the long holiday weekend!! This looks amazing! Considering I have cut out gluten of any kind, dairy, sugar (for the most part) and all processed foods, I cannot even imagine having to cut out legumes, they are my saving grace a lot of the time. Can I ask why legumes are cut out of the pale diet and/or SCD? I honestly don’t know enough about either but I am definitely curious. Great idea using the cashews instead of chickpeas though, super creative, it looks so delicious! Great question, Beth. Honestly, all I know from what I’ve read is that it’s b/c they have to be cooked to eat. They also contain phytates and lectins which inhibit nutrient absorption and cause inflammation. That being said, this is probably the one area that after I do this month long experiment, I’ll go back to eating occasionally. I see the benefits of limited/no dairy, I’m just not grasping the bean part though. I love that this is made with cashews! As a fairly new vegan family, we go through A LOT of hummus and having an alternative like cashews would be a welcome change every now and then. Add that to the fact that our tomato stores are overflowing and this is a win-win! Yuuuum. I don’t think you should apologize for roasted tomatoes. No harm in it if it means getting to enjoy something delicious such as this! I love the use of cashews here… sometimes I just don’t want another chickpea. Rare occurrence, but it happens. Triscuits. Dip. you had me at hello. LOL to your Ha and Double Ha. LOL Gina…. That looks awesome!! I just started eating more fresh things– I couldn’t imagine cutting them out…but people swear by paleo. Love that cashews work as a substitute for chick peas! At least you’ve found a sub, and a delish looking one at that! But I don’t know if I could cut out hummus. It’s practically a food group on certain days! I played by the paleo rules for a solid uhh…2 weeks. Then went back to my bread-eating ways. Just bread though…no diary, no legumes…I just needed the bread. And my garden that won’t stop throwing tomatoes at me is SO happy about this recipe. Thaaank you. haha! For some reason, the lack of bread really isn’t bothering me which I’m totally shocked by. When I did a low carb thing with my mom about 10 years ago I thought I was going to kill someone if I saw them eating bread or pasta in front of me. Whatever the reason, I don’t think I’m determined enough to go paleo, though I’m definitely excited to try out your recipes. Best of luck! dying over the soak your nuts comment! and i TOTALLY agree with you on the legumes thing. you know how i feel about paleo anyway, and i have to be honest that i can’t picture following a diet that was eaten so long ago and the people only lived a really short time. maybe it’s just me, but i love me some legumes/dairy/carbs! that being said, this hummus sounds really delicious! I love fiber-licious legumes, so I probably couldn’t cut them out of my diet completely. This does look pretty good though and I think cashews made for an excellent substitution. So creative! I love cashews and can see that they would be a great sub for chickpeas (although I don’t get the legume issue either). Love the flavors in this one! I’m almost all Paleo except I do still eat dairy. I have toyed with removing it to see how my body reacts, but I’m not sure where some of my protein will come from. What do you eat for protein type snacks throughout the day with no yogurt, cheese sticks etc? I just need to make myself try this change! snacks are hard..carrots and almond butter, this hummus, a handful of nuts, a coconut smoothie, fruit.. But I’ve found that you kind of just have to retrain your brain on paleo. Breakfast was the hardest meal for me until I started getting used to the idea that you just need to treat it like another meal. Just b/c “normally” breakfast means pancakes, waffles and oatmeal doesn’t mean that you HAVE to eat that. You could totally have steak and eggs or sweet potatoes and vegetables. You know? So snacks are kind of similar. They can be a piece of meat or half a sweet potato if you wanted! There’s definitely a bit of an adjustment period that I think I’ve finally (16 days later) just gotten over. 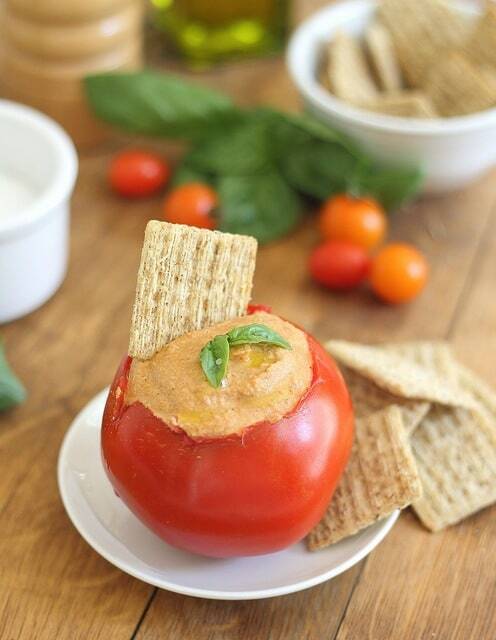 This is a terrific take on hummus! Looks so delish and I love the way you presented it in the tomato too, you creative little thing! I didn’t realize that the paleo diet eliminated legumes. I could totally kick the dairy out but legumes, not so much. I love your take on humus though, sounds perfect! I’m in the middle of taking a course about ancient Native Canadians — those who were around 16000-5000 years ago. The most interesting fact so far? Beans and legumes were the most-relied-on plant for natives of the Canadian Prairies — my ancient ancestors. So my take on it is that if they ate ’em, I can, too! That said, your hummus looks amazing and I’m gonna make it TONIGHT! Interesting! It’s just so hard for me to believe legumes weren’t consumed back then, glad there’s something that supports it! Thanks for this recipe! Looks delish! Very timely, as today is day 1 of almost Paleo for me (I’m calling it ‘almost’ because I’m not quite ready to give up the very little bit of milk I have in my morning espresso). I have a few friends who have gone Paleo, and I never understood the legume thing either. I’d definitely be missing hummus, but I love your cashew version! HAHA i laughed so hard at the nuts and turning soft LMAO, i’m so immature. i love hummus and you’re so creative in that you used cashews to create this!! jason would LOVE this, his favorite nuts (HA) are cashews so pureeing this into this masterpiece is something he’d gobble up! Soaked cashews are awesome. They’re sooo creamy! I’d love to try this “hummus”. It reminds me of a summer version of this Pumpkin Cashew Cheese Dip I made for Thanksgiving two years ago (http://www.eatingbirdfood.com/2010/11/thanksgiving-recipes-for-any-day/). This hummus looks great. Tomatoes and cashews are two of my favorite things. I’m really interested to see how this paleo thing goes. Thanks for keeping us posted! I don’t know what this Paleo thing is (gonna have to google it), but this dip looks real good! I just found your blog through Instagram. I haven’t tried this hummus yet, but it sounds absolutely divine! I’ve made a Paleo hummus with zuchinni before and it was amazing…but this recipe sounds even better! As for the whole legume thing, I’m pretty sure that they’re discouraged simply bc they’re so high in carbs and not an efficient source of protein, unlike what so many people think. Good luck with the experiment. I allow myself raw/grass-fed full fat dairy- only pasteurized milk really bothers me. You should try homemade almond milk sometime; it’s fabulous & is an excellent replacement in homemade lattes. ;) Oh, and your photography is beautiful! I totally agree with other commentors about the odd legumes bit–as far as I’ve heard, it’s less about the individual components of the foods we consume and more about the lifestyle (moderation, balance, activity, etc.) that really matters. The Chinese have been eating vegetables and rice (a carb!) for nearly forever, and they’re all a-okay to go! Have you read anything by Michael Pollan before? He’s a prolific writer and wrote some terrific books on getting in touch with our food again (I loved Omnivore’s Dilemma, but In Defense of Food is also great). That being said, I’d love to hear how the rest of this month goes for you–it’ll be interesting to see how you feel by the end of it! Thanks for a very thoughtful post! Ala, thanks for your comment. In regards to being healthy, I 100% agree about the lifestyle > the parts. I’ve read all of Michael Pollan’s books and he’s actually what started me on the path to whole foods about 3 years ago. This paleo thing is a challenge to myself b/c I’m curious of what the effects may be. It’s a bit severe for my liking but I am curious what might happen if I totally eliminate dairy/added sugars/grains, etc. I think there is a difference between eating to be healthy (which is how I’d label Michael Pollan’s approach & my approach before this paleo thing) and eating to be lean. My goal is to see if the combination of paleo + crossfit equates to lean. I’ve worked out and eaten whole foods for almost 3 years and I’ve never seen the kind of definition as I’m starting to see this month which is an interesting thing to me. So, that being said after the 30 days or so, I do plan on bringing some things (like beans) back into my diet for a more rounded out approach to food but I do think this was pretty eye opening for me about how I feel and what the effects are from eating dairy and grains. Sorry for the long-winded response! This looks soo good! Are you still eating grains though? Triscuits would not be Paleo neither would grains- correct? Just curious and wondering if you are taking a differnet approach. I have been closer and closer to eating Paleo but have not cut out dairy (beans here and there) but know grains are a big no! So excited to find this recipe. I am eating mostly paleo. I too wondered why legumes are out. Upon research, I found that in addition to the reasons listed above, legumes (and rice) are simply not the healthiest/effiecient way to get the nutrients the provide. Robb Wolf has a great chart on his site that lists the common misconceptions about nutrients and the best foods to provide them. He includes the most questioned ones like fiber, calcium, etc. The ones that people think they’ll miss on the paleo diet. It’s a very interesting and eye opening read.